The mod is clientside and the extra tabs added will work on any server. The food tab is sorted by saturation, which is a hidden food stat, that specifies how soon the player will be hungry again. The icon changing will also work with tools or food added from mods. Barriers are only visible when you are holding a barrier in your hand. Grass path are not available as a block, but is normally aquired by right-clicking grass (or dirt?) with a shovel. If you place a head and later change your skin, the head will not change. The mod is WIP so more tabs will be coming soon and way of sorting tabs may be improved. Thank you very much for the mod showcase. I am going to add it to the thread. Atleast for now. You are right, the post is getting kind of long. I should start using spoilers. I also added the "unavailable" items to the search tab. Including many less visible updates and of course the removal of herobrine. Probably the biggest update so far has just been released. Check out the "Features" section and see if you can discover something new! I am looking forward to some feedback from you guys! Added Broidery & Cartography tabs. Reverted back to a previous better way of sorting the building blocks tab. Changed icon of skulls tab back to player's own skull. Added support for Forge's update checker and added mod-logo to the modlist. Search tab now contains ALL items - also changed it's icon to a watch. I would like to hear from the people, who use this. What kind of updates would you like? Ruukas I am working on a modpack that should be on FTB today and I was wondering if I can have permission to put this on it? Yeah, sure! That's okay. Are you able to provide a link back to this thread, somewhere in the pack? It would also be nice, if you could send me a link to the modpack, when it's done. 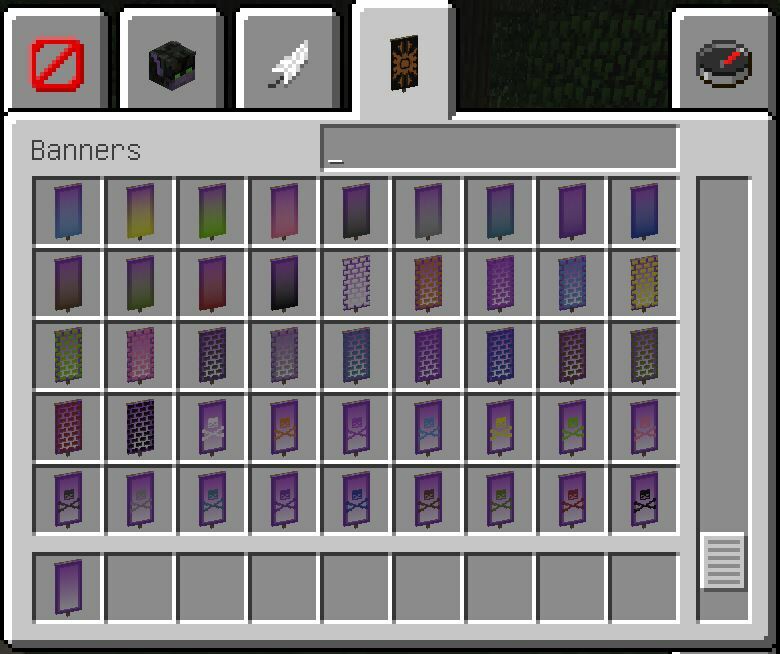 Also, if you have some idea for the mod, please let me know. It really helps towards my motivation for working on the mod. Note: To anyone else reading this, if you want to add your mod to a modpack, please ask for a seperate permission. This is only for HStith. I have been working on update 0.7 for the past few days. It features 3 new tabs and exciting new features for the skulls and the banner tab. 0.7.3 has just been released! Firework Tab - Easily make a ton of customized firework! Death Tab - Recollect the items you had before you died. Memory Tab - Memorize the contents of the last container, you opened. Search option on the Skulls tab now makes it possible to get any player's skull! Better documentation consisting of notes scattered around the tabs with useful advice. If you have advanced tooltips enabled (F3+H), you will be able to see the quality of food items and for anything else, you will be able to the see item class. Version 0.9 has just been released and I really excited for you guys to try out the new features! * An unknown AE2 API is installed (rv4 from appliedenergistics2-rv4-alpha-1.jar). * Our API got loaded from MoarSigns-1.10.2-4.0.1.4.jar. That's unexpected. Basically the method that you use for comparing things violates the transitivity rule, where flipping the arguments gives a different result, where it should give the same result. Java seems to verify that this happens to prevent things from going FUBAR. Sorry to hear that. Thank you for reporting. I will fix it ASAP. Would you mind telling me which tab this happened on? Most of the tabs are sorted differently and I can't find anything in the log specifying which sorter is flawed. You should be able to play if you disable the tab (meaning it will return to the vanilla variant, unless it's one of the tabs added by the mod) in the config. Of course I would still like to solve the bug. It happened a few seconds after I pressed 'E' to open the inventory. The inventory hadn't opened at that time, so I don't know what crashed. The game simply locked up and crashed. I use JEI, which may be part of the issue, FWIW. I've removed the mod for now, but I will add it back in when the fix is applied as it looks VERY useful. I would really like to fix the crash, but I have never seen it before, and to be honest I can't really tell where the error is happening. If it happened right after you opened your inventory, it must be on the "Building Blocks" tab. However, it's still not much to go on, especially if I can't reproduce the crash. "Collections.sort(stackList, sorter);", which just sorts the list of items of the currently selected tab using the appointed sorter. The sorting algorithms are the first part of the mod I wrote, though, so I am considering rewriting it. Especially since I've just had a course on efficient sorting. I guessed as much. I currently have over 200 mods installed (I need to update forge to actually run some of them), and I have ModLister installed, so you can see my modpack on the ModLister website. (May be a bit outdated until I get forge updated, might be a few minutes). It probably would take quite a while to figure out which mod is causing the issue (although I do have an idea as to which one is the issue). That's a shame... I don't know which part of the mod you are more interested in, the extra tabs or the sorting. Going to the in-game config settings through the mod list should allow you to disable overriding of the vanilla tabs. The tabs added by my mod doesn't use sorting algorithms, because I wrote them to be sorted how I wanted them to be. Therefore, if you disable overriding of the vanilla tabs, you should be able to play with my mod installed. You will still have the extra tabs, but vanilla tabs wont be sorted. You could also try disabling the tabs one by one to find the culprit. 90% of the time I use the search tab to find items as I have so many mods installed. I'll try disabling the tab override and see what happens. I have been busy these last couple of days and didn't check for comments. Did it solve your issue? I am working on a complete rewrite of the sorting for the next update, which will make customizable sorting possible in the future.